One of the great features of FIM is that it is relatively easy to plugin custom functionality. You can extend the synchronization engine by developing rules extension and you can add custom workflows to the FIM portal. Rules extensions run under the FIM synchronization service account, workflows under the FIM service service account. This article describes an approach to enable communication to external systems (eg Exchange). Because you typically do not grant a service account rights to Microsoft Exchange, you need the ability to run part of your code using different credentials. The output of this cmdlet is a secure string object which can be used to build a PSCredential object. Following code shows how to use the PowerShell library to construct a PSCredential object. The PSCredential object can then be used to perform management operations on Exchange. If your operation requires you to connect using a network credential instead of a PSCredential object, this is very easy. You can get the corresponding NetworkCredential object from the PSCredential. Only the user account that encrypted the password can decrypt it (because Kerberos keys are used under the hood). This is illustrated in following screenshot. If you look carefully, you can check I did not cheat on the parameter. The approach described here is simple, quick and secure. 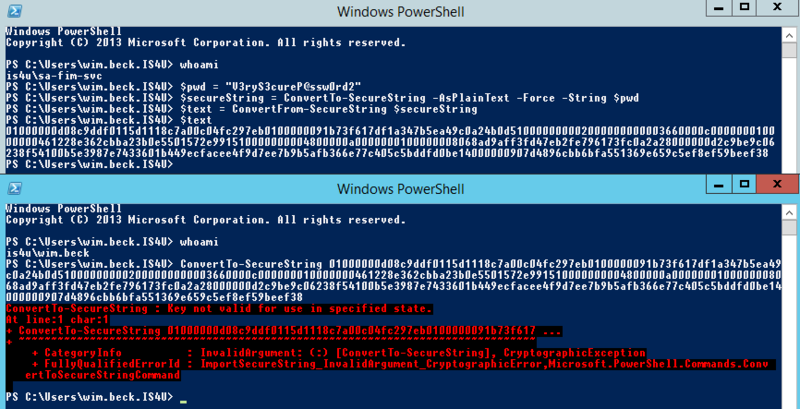 You need to run a few PowerShell commands and you can store passwords securely in your configuration files. Make sure to encrypt the required password using the service account that will be performing the decryption. Note that this technique is not limited to use in FIM deployments. You can use this technique in any .Net/Windows context.